Greetings fellow street and drag racing enthusiasts and participants. Tonight, we have a special treat. In an ultra-modern adaptation of ‘Paul Revere’s the British are Coming’, we have a bevy of American-made high-performance vehicles, all of which have been modified for the purpose of racing, awaiting the arrival of a certain British supercar. Let’s drop-in on the action as some of the Americans hone their skills on one another. In the initial pass (roll racing), a pair of identically modified (save for E85 fuel) Corvette ZR1s have squared-off. *Don’t miss the Chevrolet SS with the twin turbochargers poking through the hood*. It seems as though the blue ‘Vette may need to investigate E85 as the black car takes him for a ride in numerous hits. In the next matchup, the blue ZR1 gets a certain level of vindication as it drags a Ford Mustang Shelby GT500 with nitrous. 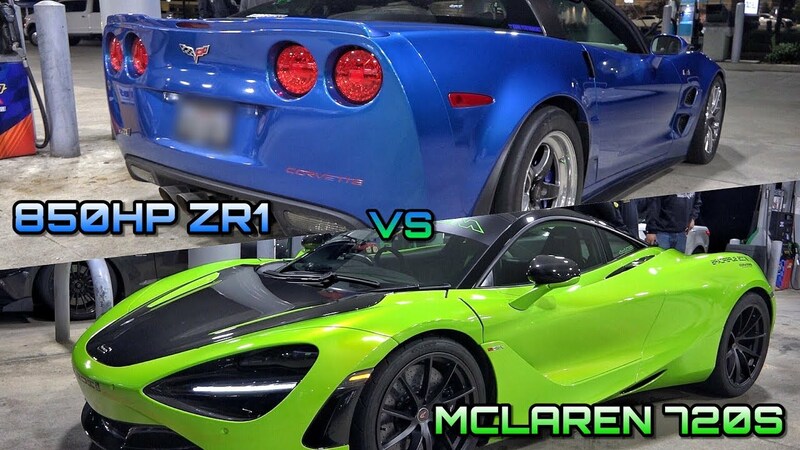 Finally, the McLaren 720S shows up to take on the blue Corvette. It appears that it won’t be a good night for imports when the McLaren loses in multiple hits. As a bonus, a twin turbo Mustang presents itself a worthy opponent to the black ZR1. Mustang claims over 1,000HP from a Hellion package. The 850HP ZR1 makes short work of the Ford. Tons more racing on this one. Take a look.